Look around your kitchen. Is there some way you can possibly improve and enhance your kitchen’s look? It’s quite possible to upgrade your kitchen with as little effort and cost required, simply by installing something as simple as semi-custom cabinets! Check out these 2017 kitchen cabinetry trends and outfit your kitchen with the one that turns heads at dinner parties. However, an increasing amount of people are turning to pure white as their kitchen cabinetry finish! Homeowners are displaying continued interest in painted cabinet finishes. Additionally, homeowners are becoming more daring in their choice of finish: red, soft blues, soft green, butter, mushroom, and gray tones are the norm. Homeowners and designers are also utilizing accent pieces of distressed or worn looking wood as well as driftwood pieces in the remodeling of their kitchens. 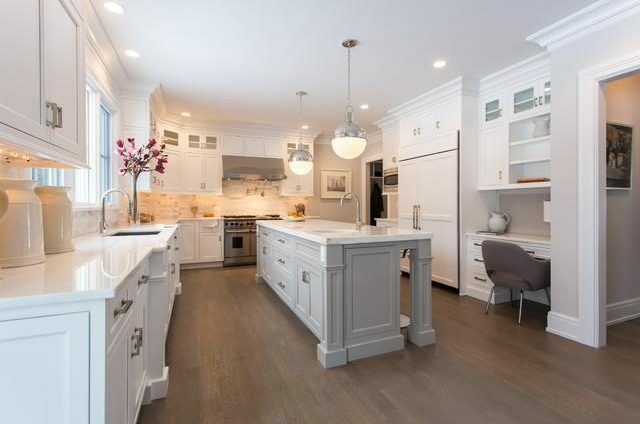 With the introduction of open American style kitchens, homeowners and designers are looking to extend this room to other living spaces. This is where custom and semi custom kitchen cabinetry can bring some benefit. An increasing amount of homeowners are custom designing cabinetry that resembles furniture or which serves a dual purpose. An example of such an extension piece would be a tall armoire-like cabinet with glass doors, offering aesthetics and function in the kitchen. Open shelving isn’t a 2017 trend but a much earlier one. Still, it has been appearing in kitchen designs across the country since the start of this year! Many home designers and owners are also starting to think practically when it comes to open shelving cabinetry. As great as this option looks in kitchens, there is always the worry of damage and breakage of the contents placed inside. Glass paneled cabinet doors are the answer! With the ability to expose your beautiful dishes and chinaware, clear glass paneled cabinetry is a functional and aesthetically appealing solution. Install frosted glass panels on your custom-made kitchen cabinetry for a more sleek and modern look. 2017 is seeing homeowners and designers choosing handles on cabinets as the ultimate kitchen designer trend. Not only are handles the obvious and best choice for cabinet hardware selection, you can find them in a number of styles! What more reasons are you looking for when this design for kitchen cabinets offers everything—minimalist, easy to open, and clean design? Another 2017 kitchen cabinetry design trend rising in popularity is the use of alternative materials for cabinetry making. Find the best quality wood as well as alternative materials for your kitchen cabinets only at cabinetry design specialist, Kitchen Cabinetry of Naples.